Off-road cyclists may like to try the Great Glen Cycle Route from Inverness to Fort William via Loch Ness (just over 75 miles) which has some demanding stretches. Some of the route is on the towpath of the Caledonian Canal. Contact Forest Enterprise - telephone 01397 702 184. The Great Glen Way long distance footpath is a 70 mile hike across Scotland between Inverness in the east and Fort William in the west. 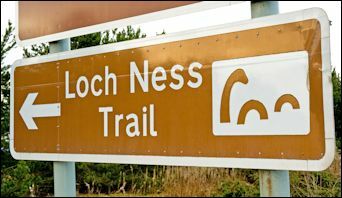 The South Loch Ness Trail is a new trail covering the 36 miles / 58 km between Fort Augustus and Torbreck (on the edge of Inverness) via Whitebridge, Foyers, Inverfarigaig and Dores (South Loch Ness). Loch Ness 360 is a new circular trail covering 81 miles/130 km starting from Inverness and including the South Loch Ness Trail. 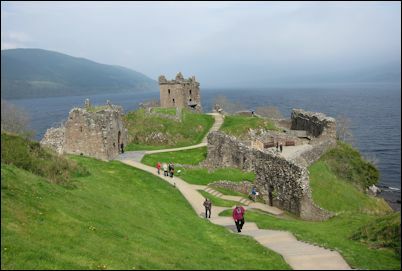 For walking on this route with baggage transfers, contact Loch Ness Travel or Gemini Walks for details. 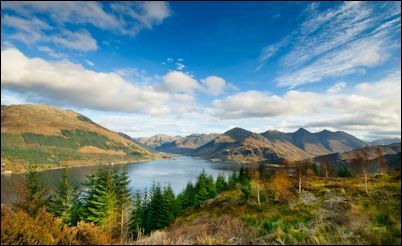 The Affric Kintail Way (44 miles) is a signposted trail for walkers and mountain bikers from Drumnadrochit to Morvich by Loch Duich (Eilean Donan Castle). You can also have an easy walk from Inverness 3 or 4 miles up the canal to the locks at Dochgarroch and then walk back on the other side. The Great Glen Canoe Trail opened in 2012 and the web site includes info about local equipment hire. There are many boating / sailing operators on the Caledonian Canal offering yachts and motor cruisers for hire - click here. Experience4x4 has 40 acres of private land and can offer a 4x4 off-road Driving Experience on a Highland themed adventure course with 19 obstacles. Pay and Play with your vehicle is available on certain days. They also have an Extreme Quad Biking area. Multi-activity packages available for corporate groups or Stag and Hen groups. Situated 20 minutes south of Inverness at Loch Duntelchaig, by Farr. Tel: 07825 428227. In Your Element can offer guided canoeing on Loch Ness and on the River Beauly (Aigas Gorge). Great Glen Canoe Trail (5 day expedition) also possible. They can also provide a wide range of outdoor activities for groups (abseiling, archery, bushcraft, canoeing, climbing, gorge walking, mountain biking, raft building, sea kayaking, team challenges). Canoe/kayak hire is available (tel: 0333 6006008). For outdoor enthusiasts in the area, visit the WalkHighlands page about Loch Ness and Glen Affric walks. Borlum is a BHS approved riding centre at Drumnadrochit near Urquhart Castle on Loch Ness. Instruction, trekking and holidays. Children's Club and Gymkhanas. Riding for the Disabled. Indoor school with spectator gallery, all weather outdoor manege and jumping arena. Self catering accommodation and campsite also available. Tel: 01456 450220. Highland Trekking and Trail Riding at Cougie, Tomich, Cannich (Glen Affric) offers rides for all abilities. Tea hut and picnic area. Hens, ducks, rabbits & guinea pigs to feed. Guided walks, boating and fishing. Long distance trekking by arrangement. Tel: 01456 415 323. Rhoda McVey of Making Strides offers tailor-made horse-riding holidays and tuition. Tel: 07770 427502. Twenty-four miles long and a mile wide in places, it reaches a depth of some 700 feet. Loch Ness is of course famous for its legendary monster Nessie which may have been seen by Saint Columba way back when. You can easily drive or cycle around the loch yourself or go on a bus tour (see the Inverness trips page). The complete circuit is 70 miles and can take a whole day by car if you stop at some of the places mentioned below. The southern side of the loch is less frequented by tourists but well worth a visit for its beautiful scenery. The road has a great scenic viewpoint at 1162 feet overlooking the loch and mountains. The road passes through villages such as Whitebridge, Foyers (waterfall), Inverfarigaig (forest walks) and Dores. For food and drink, The Dores Inn (tel: 01463 751203) is recommended, 8 miles south of Inverness. At Foyers, Camerons Tea Room and Farm Shop (tel: 01456 486572) is worth a visit. Visit the South Loch Ness web site for details of local services, accommodation, events, etc. There is a wide variety of accommodation around Loch Ness - including cottages, lodges & chalets and Bed and Breakfasts. 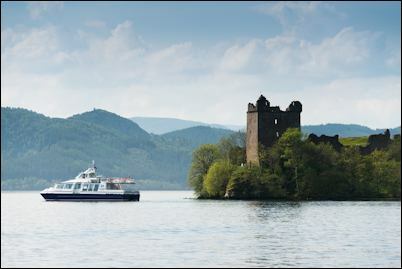 Boat trips can be taken from the northern end, the middle or the southern end of Loch Ness. For 40 years, Jacobite has helped visitors to experience the mysteries and myths of the world famous Loch Ness. They operate cruises and coach tours with a choice of options lasting from 1 to 7 hours. 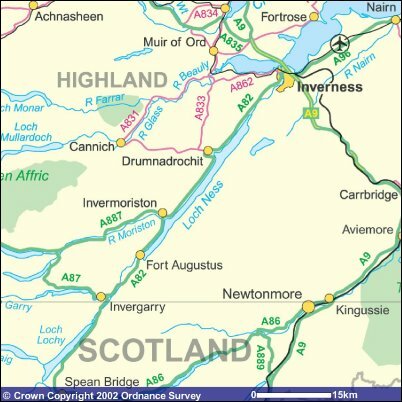 Depending on the option you select, there are departures from Inverness Bus Station, Tomnahurich Bridge (2 miles from Inverness city centre), Dochgarroch Lock (5 miles outside Inverness) and Clansman Harbour (4 miles from Drumnadrochit, 10 miles from Inverness). All vessels have free WiFi. Scottish Tourist Board 5 Stars. Tel: 01463 233999. The Loch Ness Centre and Exhibition offers boat trips on 'Deepscan', the research vessel to the Loch Ness Project. Regular hourly cruises. Details on their web site. Tel: 01456 450218. Cruises operate Easter - end September on the hour from 10am - 6pm. The Nessie Hunter runs daily from Easter to December. Bookings and departures from the Celtic Crafts gift shop at the Nessieland (previously known as the Original Loch Ness Monster Visitor Centre) (tel: 01456 450 395). Look out for the sign pointing up the hill to Abriachan Nurseries - 9 miles south of Inverness on the A82 Loch Ness road (between Lochend and Drumnadrochit). High quality range of rare and unusual plants. R.H.S. partners and members of Scotland's Garden Scheme. Open daily from February to November. Tel: 01463 861 232. Nearby is the start of the Abriachan Forest Walk where you can also see a bird hide and the replica of a Bronze Age Hut. Drumnadrochit Village Green is nicely decorated with floral displays. Have a browse around and a cake or ice cream at Drum Farm Courtyard. Enjoy a meal at Fiddlers restaurant (telephone: 01456 450223). Opposite here is the post office and grocery. There's also a Scotmid supermarket in Drumnadrochit. Access free public WiFi thanks to Highland Council. Log on with your social media details or by entering your email address. The Glenurquhart Highland Games are held here in August. Between Drumnadrochit and Urquhart Castle is Borlum Farm which is a BHS approved riding centre, together with self catering accommodation and campsite. Tel: 01456 450220. 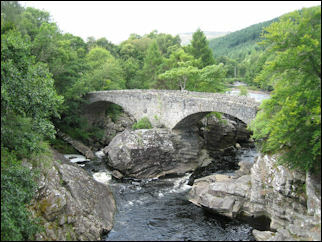 For additional information about Drumnadrochit and area, take a look at VisitDrumnadrochit.com. 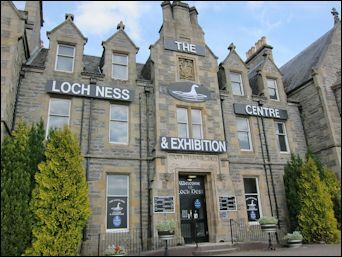 Established in Drumnadrochit in 1980 as the first ever exhibition based on Loch Ness, The Loch Ness Centre and Exhibition offers a hi-tech informative exhibition which has 7 areas (17 languages available), shops, hotel, restaurant and bar, plus a field centre (with lab and classroom, ideal for school visits). Scottish Tourist Board 5 star visitor attraction. Open all year. Disabled facilities. Wheelchair friendly. Advance ticket purchase available online. Tel: 01456 450 573. Shopping facilities within the centre include Kiltmakers, The Nessie Shop, Whisky Shop, Cashmere & Woollens, Tartans, T-Shirts and The Loch Ness Gallery. 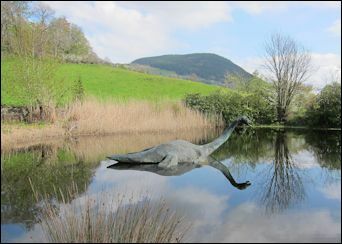 The exhibition was originally designed by Adrian Shine of the Loch Ness Project whose web site includes details of the scientific research and exploration of Loch Ness. Free work pack and puzzles for schools. Also in the village is the Nessieland which features a multi-lingual documentary, children's activity playground, hotel, coffee shop/restaurant, gift shop, etc. Scottish Tourist Board 3 star visitor attraction. Open all year. Tel: 01456 450342. Picturesque ruins on the shore of Loch Ness. Although the castle is owned by The National Trust for Scotland, access is via the excellent visitor centre run by Historic Environment Scotland which includes an exhibition, film show, shop and restaurant. Admission charges apply. The castle is open daily 1 April to 30 September 9.30 am to 6pm; and also daily 1 October to 31 October 9.30 am to 5pm, and 1 November - 31 March 9.30 am to 4.30pm. Tel: 01456 450551. 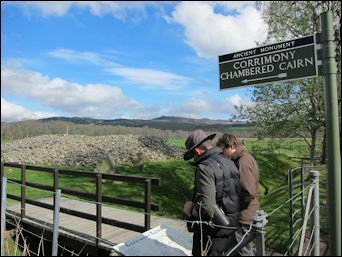 For disabled access, check with Historic Environment Scotland. Telephone 01456 450551. 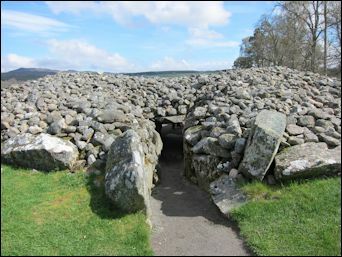 Situated in Glen Urquhart, this chambered cairn is surrounded by a circle of 11 standing stones in a field. Historic Environment Scotland. Free access. Open all year. 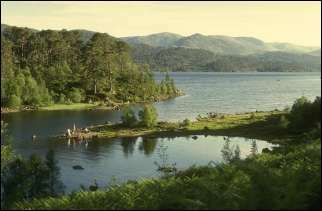 If you have time, don't miss a detour away from Loch Ness into this beautiful scenic area around Cannich for walks by Loch Affric and Loch Mullardoch. Plodda Falls can be found 3 miles from the village of Tomich - follow the waymarked walk. Based in Glen Affric, Natural High Guiding can offer walking, mountain biking, archery, bike hire for individuals, groups and corporate events. The Glen Affric Duathlon takes place on 11 May 2019. Local accommodation in Glen Affric includes Shenval - an organic Bed & Breakfast where your French-speaking hosts are a toy maker and photographer, and a handloom weaver. Situated between Drumnadrochit and Cannich. Westward Bed and Breakfast is a family run B&B in a beautiful Victorian Highland house where the comfortable rooms retain their pine linings and the guest lounge has an antique solid fuel stove. The Slaters Arms in Cannich offers good food and drink with WiFi access, plus self catering accommodation in timber cabins. Tel: 01456 415215. Cannich is situated midway between Drumnadrochit (13 miles) and Beauly (15 miles) on the A831 road. From Cannich, you can cut across country to Beauly via the back road. Back on the main road from Inverness to Fort Augustus, a roadside cairn was erected by the local people as a memorial to the famous racing motorist who died in 1952 whilst attempting to break the water speed record on Loch Ness. Remains of a bridge built by Thomas Telford in the early 19th century. It is a quiet, leafy spot from where you can watch the fast-moving white water of the River Moriston. Starting point for some good walks. The Glenmoriston Arms Hotel offers good food and accommodation. It has a bar with 150 single malt whiskies. Tel: 01320 351206. It's a handy place to stay overnight or just stop for a meal if you are taking the road to Kyle of Lochalsh and Skye which cuts across country from here to the west coast. Lann Dearg Studios offer flexible B&B accommodation or self catering studios - ideal for walkers on the Great Glen Way. For more local info, visit the Fort Augustus and Invermoriston web site. Parking spaces, intepretative panel and woodland walk overlooking Cherry Island (the only island in Loch Ness). The tiny island features a 'crannog' which was probably built 2000 years ago and later housed a mediaeval castle. 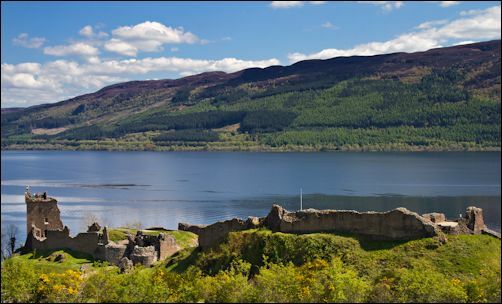 Situated at the southern end of Loch Ness, 33 miles south of Inverness. Souvenir shops, golf course, garage, hotel, tourist office, bank, post office, cash dispenser. Fort Augustus has free public WiFi thanks to Highland Council. Log on with your social media details or by entering your email address. The Caledonian Canal cuts through the village on its way down to Fort William (31 miles away). 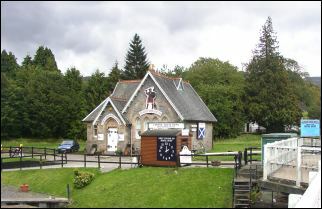 The Caledonian Canal Visitor Centre gives information about the canal and has a gift shop, deli, cafe and toilets (tel: 01320 366 493). 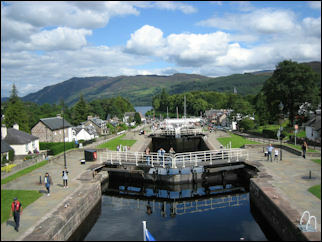 You can watch boats passing through the series of locks or go on a cruise up Loch Ness. On the shores of Loch Ness, the Benedictine Abbey stands on the site of the fort built in 1720 by General Wade to subdue the Highlanders. It was named after the King's son, William Augustus, the Duke of Cumberland who became known as 'The Butcher' after his victory at Culloden. In the mid-18th century the Lovat family used the building as a hunting lodge and then in 1876 leased it for a peppercorn rent of 1 pound to a group of English and Scottish monks who had returned from Germany (althought the rent was never actually collected). The monks founded a monastery and later ran a boarding school here up until 1993. Subsequently they set up a heritage centre, restaurant and accommodation block, but it had to close and was sold. The new Highland Club development of the abbey buildings now offers exclusive holiday home accommodation and residential apartments. Please note there is no access to the private gardens. 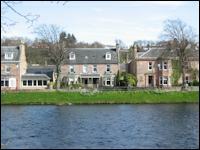 The Boathouse Restaurant is next to the abbey grounds on the lochside and is open for lunch and dinner. Facilities for diners bringing with their boats. Advance booking recommended in the summer (tel: 01320 366682). Another visitor attraction is The Clansman Centre. 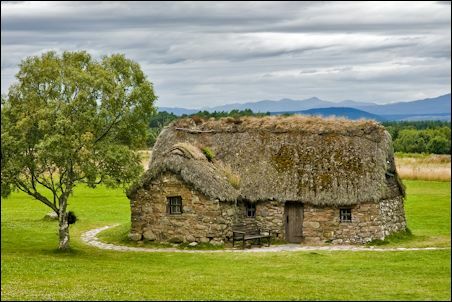 Located not far from the abbey grounds, in a reconstructed Highland Turf House close to the canal locks. You can see and hear how the clans lived in the 17th century in the museum and live exhibition. Hire a costume and have your photo taken as a Highlander. Weapons demonstrations given during live re-enactments too. Open 7 days a week 10am to 6pm during the summer season from April - October. The Cruise Loch Ness can be found near the Clansmen Centre. Boat trips on Loch Ness depart from here every day (except Christmas/New Year). They have several boats including a catamaran. Toilets and bar onboard. These cruises have been awarded 5 stars by VisitScotland and most are 50 minutes long. You can see what's underneath the surface by watching the sonar display screens. Evening cruises (60 minutes) available from May to August. They also operate RIB rides (at 30 knots) from April to October (1 hour - 3 hours). Telephone 01320 366277. The Bothy Restaurant & Bar is located in the former village smiddy by the side of the locks. Tel: 01320 366 710. Next door is the Highland Ice Cream shop. 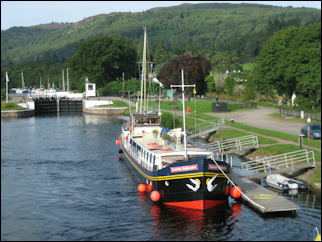 For more information about Fort Augustus visit the the local community web site. This windswept heath is where Bonnie Prince Charlie's men were defeated by the Duke of Cumberland, known forever after as "The Butcher". One thousand two hundred Highlanders lost their lives here on the morning of 16th April 1746. Buried in mass graves, they are remembered through stones which bear the names of their clans. The best time to visit is when the purple heather is in flower. The new Visitor Centre with audio-visual show, exhibition, restaurant and bookshop is open all year. Access to the battlefield itself is free. There is a charge to access the exhibition and Old Leanach Cottage (inhabited until 1912 and now refurbished to look like it would have done in the 18th century). 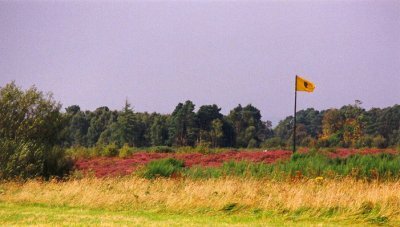 The battlefield is in the care of the National Trust for Scotland. Wheelchairs are available. Guided tours take place during the summer. Tel: 01463 790 607. A Commemorative Service is usually held here each year on the Saturday nearest the anniversary of the battle. Unique set of 3 Bronze Age chambered cairns each surrounded by a stone circle in a wooded field. A most unusual place for both its atmosphere and history - well worth visiting if you are interested in ancient sites. 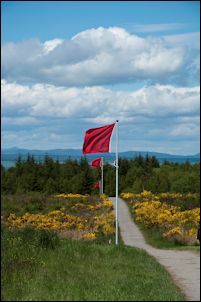 It is signposted as a right turn off the main road just after Culloden Battlefield when you are heading towards Cawdor Castle. The Historic Environment Scotland web site explains the history. The Highland Council's Historic Environment Record is full for historic details and photos. Robert Pollock has an excellent guide to this site. And you can view more photos online by Phil Wright. This L-plan castle with its decorative stone crown is located 8 miles east of Inverness on the B9006 road. It was built in 1621 by the 8th Lord Lovat and was the mustering point of the Government troops before the battle at Culloden in 1746. By the 19th century the castle had lost its roof and upper floors, but it was later restored by descendants of the earlier Macintosh lairds. It used to be open to the public until it was sold to new owners in 1996. 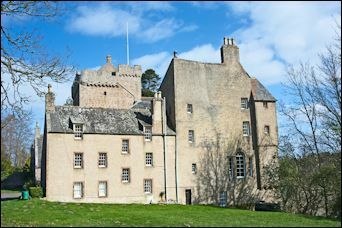 This haunted castle is located a couple of miles outside of Inverness just off the A96 road to Nairn. Bonnie Prince Charlie may have slept here. Previously it offered B&B accommodation but as of 2015 it is closed for refurbishment. Castle Stuart Golf Links opened in 2009 and hosted the Scottish Open from 2011 to 2013. It will be the venue again in 2016. Tel: 01463 795440. Close to Inverness Airport and the former RAF Dalcross air base is the Highland Aviation Museum. Old aircraft on display include a Buccaneer, Tornado, Hawker Hunter, etc. as well as the front 54 feet of a Nimrod MR2. The indoor display covers the RAF stations at Kinloss, Lossiemouth and Dalcross. Open at weekends 10am - 4.30pm. Run by the Highland Aircraft Preservation Society. Tel: 01667 461100. 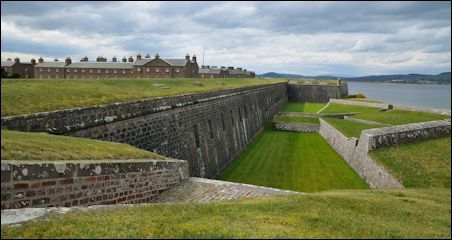 Fort George is close to the village of Ardersier (see historic photos). 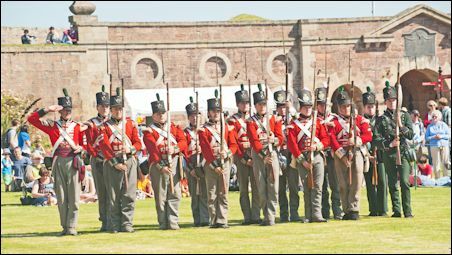 Built as the Highland garrison fortress for the Hanoverian army of George II following the Battle of Culloden, the fort stands on a headland overlooking the Black Isle. Today its mile-long rampart encloses the Highlanders Museum (featuring the Queen's Own Highlanders Collection) and a working garrison spread over an area of some 42 acres. 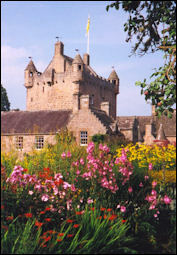 The site is managed by Historic Environment Scotland. Admission charge. Exhibition, visitor centre, restaurant and gift shop. Telephone 01667 462 777. Open daily from April to September from 9.30am to 5.30pm, and from October to March from 10am to 4pm. Please note that the castle is no longer open to the public for tours. Cantray Park (part of Cantraybridge College) at Croy is a social enterprise with a cafe (open Wednesday to Sunday 10am - 4pm), aviary and small animals centre (open Wednesdays, Thursdays and Fridays from 2pm to 4pm). Sales of college products including wooden gifts and furniture, fresh garden produce, fresh lamb and garden plants and flowers. Tel: 01667 493500. This is one of my personal favourites so I have created separate web pages of detailed information and photos. Well worth a visit. The castle and grounds are open daily from 13 April to 6 October 2019 between 10am and 5.30pm. You can also visit the gardens of Auchindoune House (where the Dowager Countess Cawdor lives during the tourist season). This is 30 minutes walk from the castle through the woods or a few minutes' by car. The gardens are usually open on Tuesdays and Thursdays in May, June, July and August from 10am - 4.30pm and at other times by appointment (tel: 01667 404401). There is an honesty box. A few miles after Nairn, Brodie Castle is another one not to miss. Guided tours of the castle run every 30 minutes. Open daily (except Christmas and New Year). The grounds are open all year. Owned by The National Trust for Scotland. Often overlooked by visitors is the Conservation village of Cawdor itself, a quiet place well worth walking around. There are several pretty old houses, a fountain, bowling green, tavern, school, post office and shop. Cawdor church was built in 1619 by the then Thane of Cawdor, Sir John Campbell, after he survived being shipwrecked when returning from the Isle of Islay. There are usually several guided walks organised during the summer - telephone 01667 404 666 for full details of this year's programme. If similar to previous years, these will include walks of between 1.5 hours and 4 hours to see varied habitats within the local woodlands, and perhaps Findhorn Valley, Loch of Boath or Findhorn Terraces.